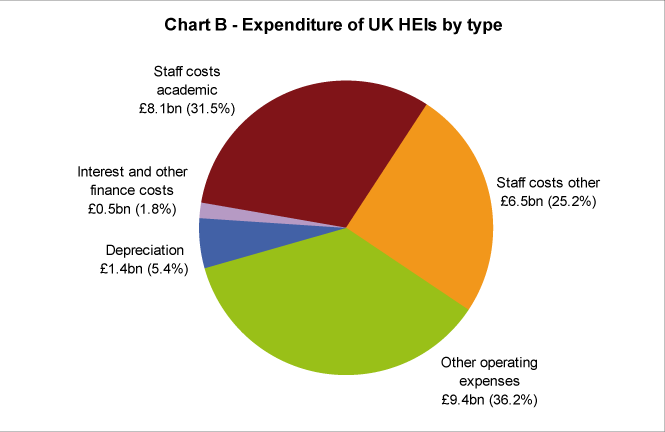 The newly released HE Finance Plus 2009/10 downloadable publication from HESA shows that the total income of higher education institutions (HEIs) last year was £26.8 billion. Funding bodies provided £9.0 billion of this income, while tuition fees and education contracts contributed £8.3 billion. The different sources are further broken down in Table 1 below. The recurrent teaching and research grants account for most of the funding body income at £5.8 billion and £2.0 billion respectively. Income from home and EU domicile students’ course fees was £5.1 billion – 19.1% of the total income for UK HEIs. Non-EU students’ course fees totalled £2.6 billion in 2009/10 accounting for 9.6% of total income. The Research Councils, The Royal Society, British Academy and The Royal Society of Edinburgh together contributed the largest portion of research grant and contract income. 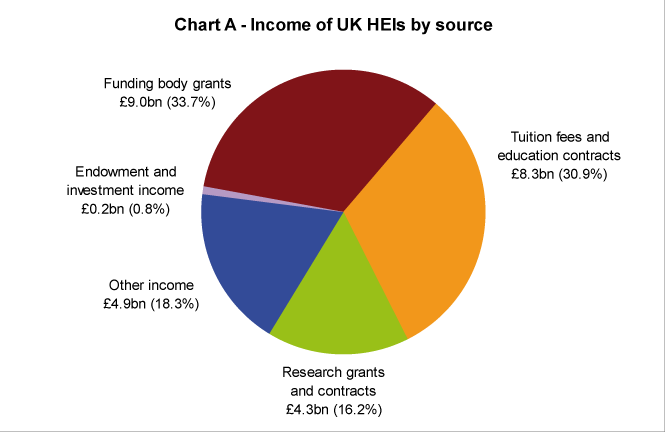 Research grants and contracts from non-UK sources contributed £741 million (2.8%) to the total income of UK HEIs. Residences and catering operations added a further £1.5 billion to the income of HEIs while investment and endowment income added a further £219 million. * Includes income from joint ventures. Table 2 shows the changes in income from the major sources from the previous year. Income from tuition fees increased by 13.4% while endowment and investment income fell by 39.0%. HE Finance Plus 2009/10 includes finance data broken down to institutional level including tuition fees and education contracts, balance sheets, cash flow, capital expenditure, financial profiles and more. HE Finance Plus 2009/10 is available to purchase and instantly download from our website. A new HESA product, Finances of Higher Education Institutions, containing a subset of the HESA finance collection will be published in May. Results of the 2009/10 HE Business and Community Interaction Survey will be published in June. A full schedule of all HESA releases for 2011 can be found here. Values in Charts A and B are shown rounded to the nearest £0.1 billion. The sum of these values may not match the total values given in the text. Percentages in all Tables and Charts are shown rounded to one decimal place and may not sum to 100%. HESA Finance data is collected from all publicly funded Higher Education Institutions (HEIs) in the UK, plus the University of Buckingham, which is a non-publicly-funded institution. The 2009/10 data covers 165 HEIs (130 in England, 12 in Wales, 19 in Scotland and 4 in Northern Ireland). Where comparisons are made between the latest financial year (2009/10) and the previous year (2008/09), the previous year’s figures are those reported in the re-stated financial statements. Financial data relates to the institutions' financial year, i.e. 1 August 2009 to 31 July 2010. Funding body grants include those from the Higher Education Funding Council for England (HEFCE), the Higher Education Funding Council for Wales (HEFCW), the Scottish Further and Higher Education Funding Council (SFC), the Department for Employment and Learning Northern Ireland (DEL(NI)), the Training and Development Agency for Schools (TDA) and the Skills Funding Agency (SFA). Tuition fees & education contracts includes all income received in respect of fees for students on all courses for which fees are charged. Research grants & contracts includes all income in respect of externally sponsored research carried out by the institution or its subsidiary undertaking for which directly related expenditure has been incurred. Endowment and investment income includes income from specific endowment asset investments, general endowment asset investments, other investment income and other interest receivable. Other operating expenses includes costs in respect of payments to non-contracted staff or individuals, all other non-staff costs incurred, except for depreciation and interest payable. Equipment that has not been capitalised, expenditure on maintenance contracts and telephone costs (calls, rental and non-capitalised equipment) are also included in this category. Depreciation includes depreciation costs on equipment.